How can I translate months of date field? How to translate date field in Drupal 8? I am not able to figure out how to translate months of date field into french language . I have created a view of content news listing in which news content are listed, i have added date field from backend with custom date format (22 may, 2018) in views,enabled translation for date field also created custom date format for both languages, but month are showing in default language english. By default its showing in english language (jan,feb,march....). So I just want to translate the months of date fields into french language like April=avril , I am using default core translation module that is provided by Drupal 8. You're not supposed to do this yourself. What you need to do, is to enable the core Language and Interface translations, select French as the site's language, and update the site's tranlations (this will take some time if its the first time you do this). 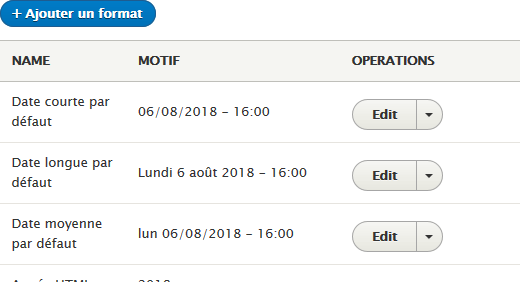 After doing all that, all long date fields should display the month names in French. What's the best way to handle date formatting and translation? How do I add a subheading to a view?